I have backpacked and day hiked into the basin many times over decades because along with Little Lakes Valley at Rock Creek, one can reach true High Sierra scenery from a high trailhead elevation and then have to climb up minimal vertical elevation into alpine lakes. Since I live in the SF Bay Area, the Saddlebag road end is much closer of the two thus the one I tend to go to. 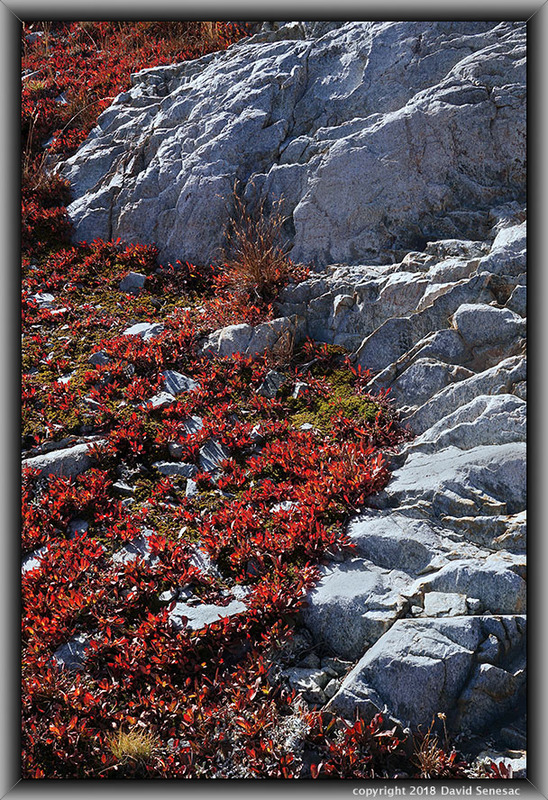 At this period of late summer, the basin is a particularly good choice for photographers interested in working in some dwarf bilberry, arctic willow, and yellow willow fall leaf color, the only vegetation at high elevations that undergoes such color change with enough coverage to make a difference. Other fall leaf color from our quaking aspen, creek dogwood, cottonwood, and willows are all at lower elevations changing later that usually begins about the third week of September and peaks early October. And Pacific dogwood, bigleaf maple, and black oak mainly on our western slopes change even later. Additionally the basin has some of the most interesting colorful metamorphic rock geology in the range. Another plus for 20 Lakes Basin besides the small lakes given its considerable glacially scoured bedrock, is it has exceptional numbers of small ponds, many more than the topo shows, that provide opportunities for lake and pond reflection shots. What is possible varies considerably from year to year depending on summer thunderstorms as many small ponds are shallow and tend to dry up by late summer unless they are receiving refills. Some notes. The well-known loop trail around the basin is one of the most popular day hikes in the range and the majority of groups backpacking in tend to site camps along that trail and near lakes or ponds within view of the trail while there is much beyond 200 feet of trails and out of view relatively empty of people. The large zone south of Shamrock Lake is one such area. One ought study the USGS topographic map and Inyo National Forest map or the recent National Geographic map for the basin as the Monroe Hall Ecological Research Area shares boundaries with Hoover Wilderness in which no overnight camping is allowed. The water taxi across the reservoir from the now closed resort no longer operates. Wilderness permits are required despite no quotas and can be obtained during office hours from either the Mono Lake Visitor Center or the Tuolumne Meadows Ranger Station.